If you love movies, you can build a home theatre. If you love books, you can install a home library. Designing a gaming room in your house dedicated only to the love of playing games can offer some unique and contemporary decorating ideas. 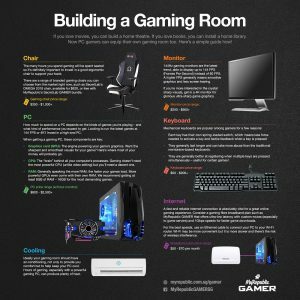 Now, PC gamers can equip their own gaming room too – here’s a simple guide how! Enjoy some of the lowest and most stable latency for many of today’s popular online games! From Dota 2 to League of Legends, our MyRepublic GAMER network is constantly optimised with custom routes to overseas game servers. Track your latency, enjoy ultra-fast downloads and receive dedicated 24/7 support with MyRepublic GAMER. Get your game on with the Playstation Pro GAMER Value Bundle today!